I just heard of this FABULOUS (new to me!) Challenge group through Korin. 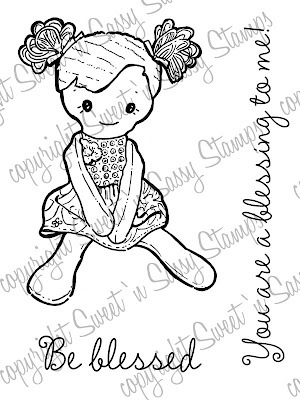 Korin, from Sweet 'n Sassy Stamps is sponsoring this sketch this week, so if you participate you have a chance to win a FREE DIGI-STAMP!!!! 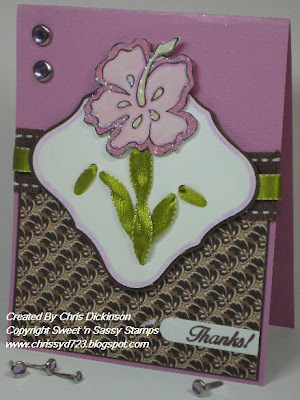 Here is the link to Card Patterns Blog. I hope you have a fabulous day! 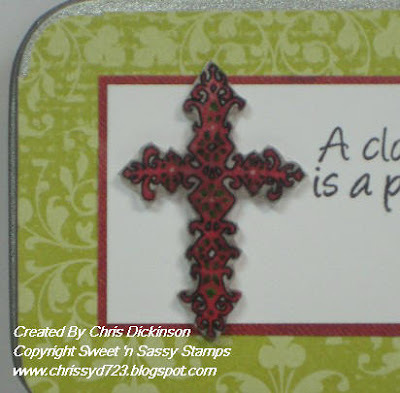 Come back Monday morning for this week's Sweet 'n Sassy Stamps Monday Challenge! RELEASE PARTY WEEKEND ONLY SPECIAL & BLOG CANDY WINNER! Here's a great deal! FOR THIS WEEKEND ONLY!!! When you spend $50 at SNSS you'll get a never before seen stamp set being released in April for FREE!! Here's Korin's sample too -- maybe the samples will entice you!!! I hope you have a great day! I am going to be resting, as I have a bit of a bug. If I feel up to it, I will come to my stamp room! Scroll down for a chance at Blog Candy!!! Good day, Friends! My sick child slept through the night, so I feel half way human today! Praise GOD! 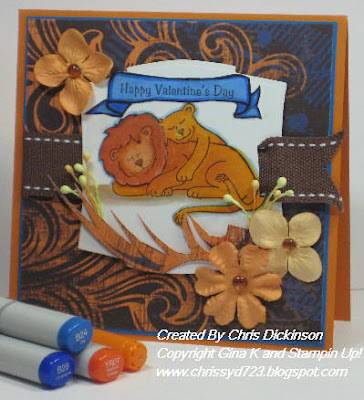 LOL I did not do any stamping yesterday, due to lack of sleep and caring for my family. My husband took the day off to burn up some unused vacation time, so I am stamping and making him tend to the sick kids! 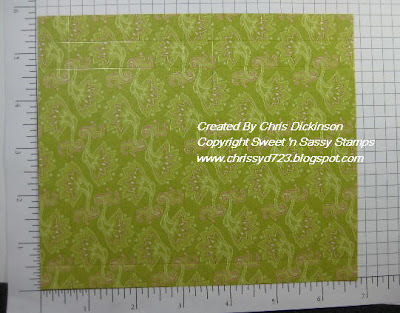 I normally have some energy to do some stamping at night but this week it JUST DID NOT happen! I was exhausted and just rested. 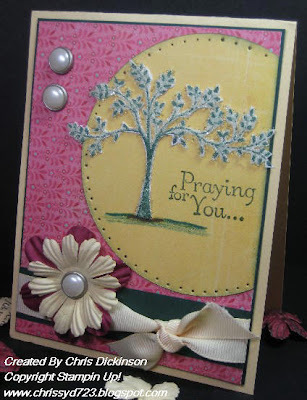 It is also a RELEASE PARTY night and Blog Hop so I wanted to use the NEW RELEASE Elegant Blessings. 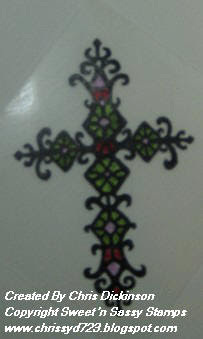 When I saw the crosses, I immediately thought of my stash of Shrinky Dink stuff, so grabbed that this morning and created a "charm". I think this would be PERFECT for someone who wants to make bracelets and things. I used Fabrico Markers and Staz On, I also sanded the polyshrink before stamping on it. 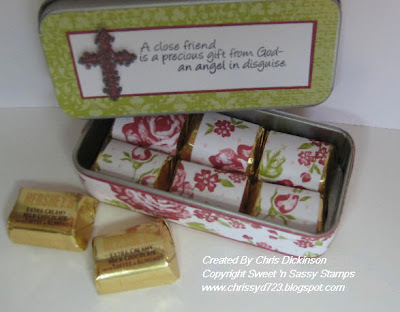 Here is a close up of the "shrinky dink"
Be sure to click on the icon the the LEFT and check out all of the other Blogger Challenges FABULOUS projects. I personally can not WAIT to see what they all altered. I am READY TO BE INSPIRED!!!! Tonight is the Release Party! We are very excited because Korin will have some WONDERFUL announcements you will NOT want to miss! Event Description:Join us for lots of fun, challenges and surprises! It is also day three of the Blog Hop. 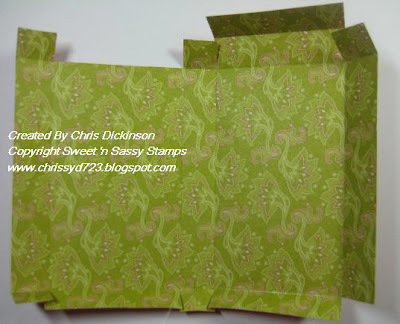 Have you found all of the Blog Candy yet that Sweet 'n Sassy Stamps is giving away? I personally am off to HOP to Sweet 'n Sassy's Blog Hop AND to see the Bloggers Challenge cards - then I need to UNBURY my desk! Have a great weekend! I will see you tonight at the Release Party! Hello! 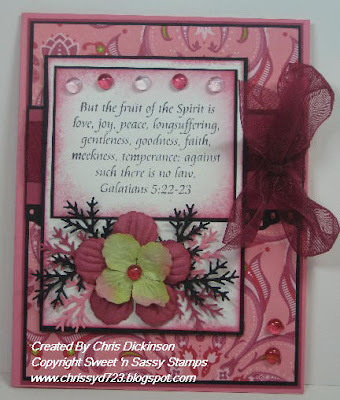 This beautiful set is one of the NEW RELEASES in Sweet 'n Sassy Stamps. This gorgeous set is called Easter Lily and is drawn by Courtney! Thank you for stopping by! Scroll down for your chance to win, if you have not tried already this week! Have a great day! First off, let me say TODAY IS BLOG HOP DAY! SCROLL DOWN FOR A SNEAK PEAK AND CHANCE TO WIN AND HOP! What is the Belli Challenge you ask? Each week, I try to give us a challenge that will use things we have lying around our stamp rooms or homes! With a constant flow of new things coming out, I tend to forget about the other things I have and they quickly become clutter! 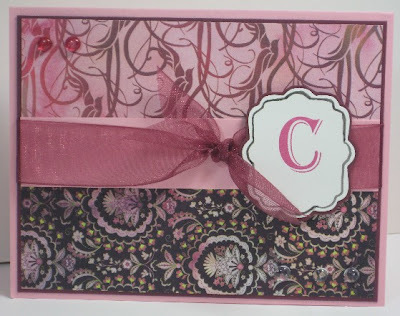 This weeks, Belli Challenge is to make a project with MONOGRAMS or ALPHABET SETS! 2. Make a completed project with your MONOGRAMS OR ALPHABET SETS! 3. Share the link here in the comments linking to my Blog and CBC56. When you post to Splitcoaststampers or Paper Craft Planet or to your Blog, be sure and put CBC56 as the KEYWORD and mention of the challenge - with a link! 4. Due to illness in my household, I will update the Guest Designer information a bit later - I apologize for the delay. I have not had time to go see everyone's projects but I want to do this!!!! Thank you for participating! My stamping time has been EXTREMELY limited due to a household of sick children and lots of time spent at the doctors office, so I kept this project SIMPLE! HELLO! This week is a busy one!!! 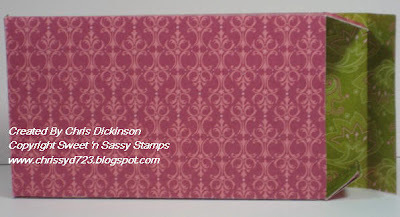 Tomorrow is the beginning of the Sweet 'n Sassy Stamps Blog Hop with the Release Party on Friday!!! I am excited! 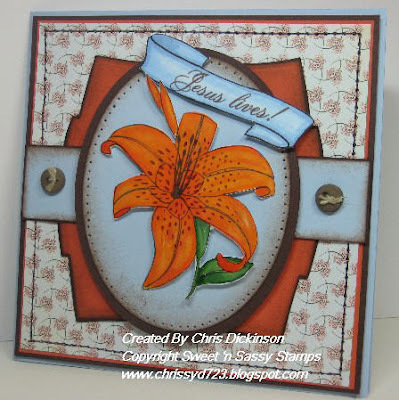 The FABULOUS Sweet 'n Sassy Stamps DT will be sharing their amazing talent with their choice of Sweet 'n Sassy Stamps on Wednesday February 25, Thursday, February 26 and Friday February 27. I decided to make today an ALL ABOUT JOY day! Joy's daughter just gave birth to a baby boy last week! So she is now a Grandma!!! Congratulations Joy and Jessica!!! I do not know how time got away from me but it is late - I hope you have a fabulous day! Thank you for stopping by! With illness hitting our home the past two weeks, I have had very little energy to do a whole lot, so I must apologize for not having much time to hop to your blogs and see YOUR work! I will try to do some catching up the next two weeks. 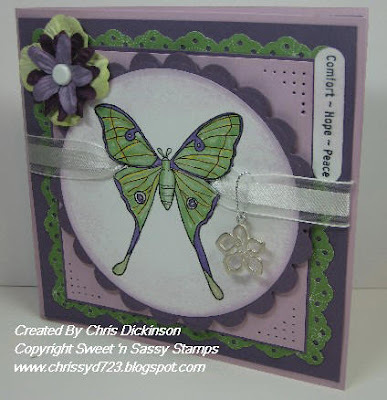 Today is Monday, and you know that means Sweet 'n Sassy Stamps Challenge! This week is quite simple... All you have to do is stamp the INSIDE OF YOUR CARD! 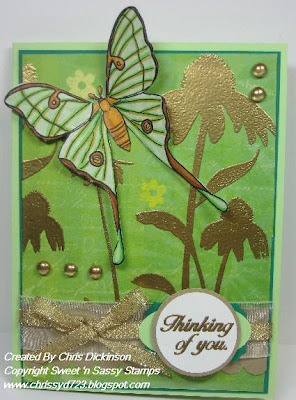 Once again, I used one of Sweet 'n Sassy Stamps new Digi - Stamps the Luna Moth. We would love for you to use SNS stamps for this challenge if you have them but if you don't please don't let that stop you from playing along. We just want to see your fabulous creations! When you upload to SCS/PCP please use the keyword SNSMC15 so we can see all the challenge cards in one place! Be sure to check these out for more inspiration! One more note...there is a new Sketch Blog on the Block. TRULY SCRUMPTIOUS. This card was inspired by their sketch #1. 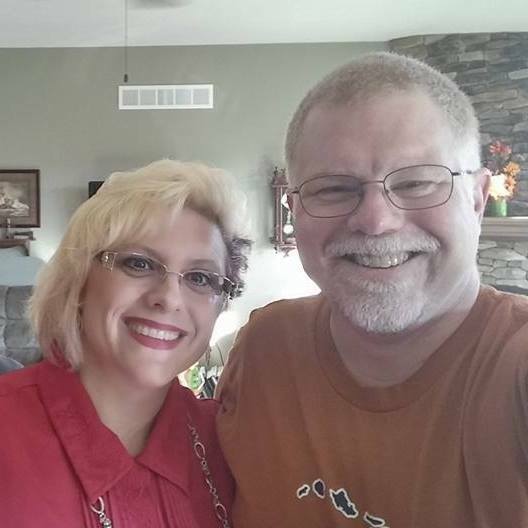 Stop on over to their blog and welcome them. One of our very own Belli Team Members is part of the Design Team! Today is also MONDAY MAIL CALL too! Don't forget to mail out the cards you create! My goal is to send out 3 cards!!! 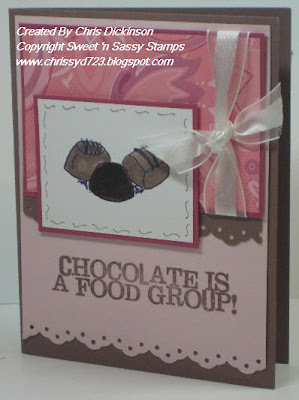 For the card that I CASED - go HERE to see Janette's GORGEOUS card! Be sure to click on the sidebar for the Blogger Challenge Participants to see everyone's projects! They are sure to WOW you!!! Have a blessed day! Hello! Happy Thursday! In December, I decided to pull my 4 year old out of her Pre-school program. Each week when I took her, it ended up being a fight to get her to stay. She wanted to come home with me and be with the other children and be "home-schooled" too. She thought she was missing something. I didn't have her in Pre-school for the academic part, I had her there for a bit of social time and so I could have a few hours to focus on the other children. Since I took her out of Pre-school, I still wanted her to have a chance to play with other children outside of her siblings and to get her out of the house, so I joined MOPS (Mothers of Pre-schoolers). I was part of MOPS several years ago and was part of their Steering Team for our local group in the past, so coming back was an easy fit for me. KidsLink Downrange is a service project for MOPS groups to help military children connect to their deployed parents by creating card kits. Military moms and dads who are deployed overseas, love getting mail from home, and they especially love personal notes from their children. MOPS groups will design card kits that contain everything a military child will need to write to his or her parent throughout the year. Anyone can choose to be a part of this project — all it takes is a little time and creativity. Once your card kits are completed, all you have to do is send them to Cadence International. After that, Cadence staff will send the kits to Fort Hood, Texas. The Military Children’s Ministry staff at Fort Hood will then disperse the kits to children with a deployed parent in cooperation with on-base school counselors. Because of the large numbers of families affected by deployment in the Fort Hood area, there is an imminent need for MOPS groups to help create card kits for kids there. Our goal is to send 5,000 card kits to the 70,000+ kids living in the Fort Hood area. Cadence International is accepting KidsLink Card Kits through March 31, 2009. Find out more about this project at KidsLink Downrange. 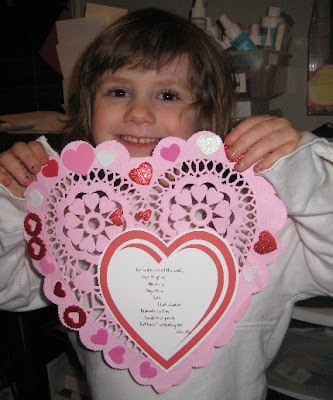 Register today to let us know how many card kits your group will create for the moms and kids at Fort Hood. 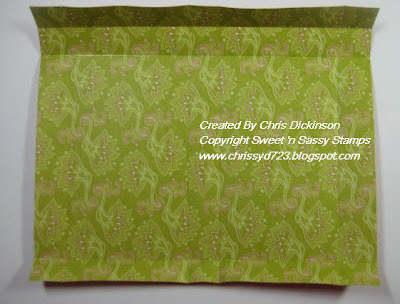 Ideas for card making and PDF download instructions are all available for quick and easy printing. Encourage military moms and their families through the Card Kit Project! This is not quite my normal card style, but I wanted it to be easy enough for even the Non-stamper to be able to make a nice card in a short amount of time. We have 45 minutes to make 96 cards (12 of each of the 8 designs). All of the boxes are packed and ready to go for the MOMS to create these cards to bless those families whose Dads are serving in the military. It actually fell into place this week, I was concerned because my three youngest children have been very sick this week and I had been sick last week and not feeling my best even this week due to lack of sleep from caring for them in the middle of the night. Praise GOD, my friend Melisa came over Monday morning for a 2 hours, and helped me by organizing some things, and coloring a few images to make the whole process go faster today. I am praying that these cards will be a blessing to those who get to send them as well as those who recieve them. It has been awhile since I have posted a recipe, so I thought I would share one with you today. We made this recipe this past month and to be honest when we made it, it was a lot of work but made A LOT of food. I wasn't sure about it, but wanted to try it. We have a friend who is a PICKY eater, so I thought I would try it out on him. Everyone LOVED it! This recipe makes a REALLY large pan or I actually divided it up in 2 - 9x13 pans. I am having company over this weekend and made 2 more pans Sunday, put them in my freezer for Saturday night. If you like make this recipe and like it - post a reply here! What is the Belli Challenge you ask? Each week, I try to give us a challenge that will use things we have lying around our stamp rooms or homes! With a constant flow of new things coming out, I tend to forget about the other things I have and they quickly become clutter! 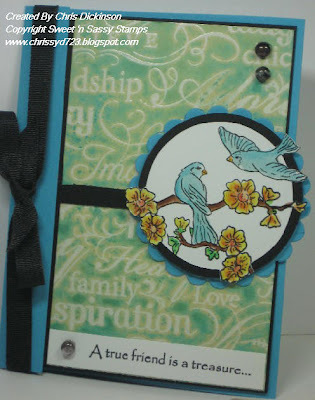 This weeks, Belli Challenge is to make a project with INCHIES!!! 2. 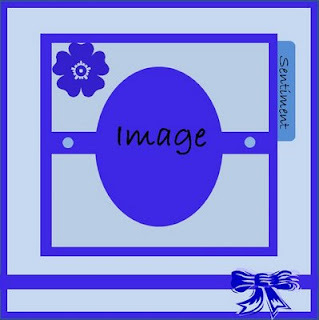 Make a completed project with your INCHIES - an inchie is an image on a ONE INCH SQUARE! 3. Share the link here in the comments linking to my Blog and CBC55. When you post to Splitcoaststampers or Paper Craft Planet or to your Blog, be sure and put CBC55 as the KEYWORD and mention of the challenge - with a link! 4. I will do a drawing and the person whose name I draw will be a BELLI GUEST DESIGNER the Fourth week of March. Last week's winner was Suzanne check her Beautiful project out HERE. I love the softness of the purple with the doily! Very elegant. 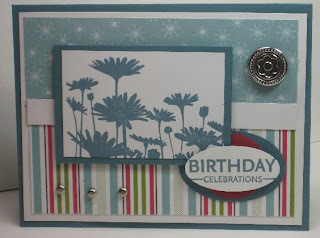 We also have a Guest Designer this week, Shannon Bracken and her blog is http://shannonssentiments.blogspot.com/ Check out her creation too!!! Leave her some love too so she knows you have been there!!! Hello! I meant to post this last night, but after spending the entire day at the hospital with my teen daughter, I came home exhausted and with a bad attitude. My daughter was having severe abdominal cramps and the doctor was concerned that it was her appendix. We first went to the Urgent Care and they sent us over to the emergency room. Six hours later, and several tests and lots of waiting, we found out it was her diet that was causing the problems and was giving her indigestion and other issues with the bathroom. (I will spare you TMI) The last 2 hours in the emergency room, I sat there listening to my daughter complain about wanting to go out with her friends and how BORED she was and then got the big eye roll (I hate that) when I told her how this could have been avoided. Instead of leaving the hospital Praising God that is wasn't more serious and that it was something minor. I left feeling angry at her for making the choices she does regarding her diet and extremely irritated with her complaining about the doctors orders to change her diet. I spent the entire night focused on her attitude and how UPSET I was with her instead of focusing on the ONE that COUNTS! With that being said, my 7 year old woke up with a fever at 4 am, so I am a bit slow this morning. 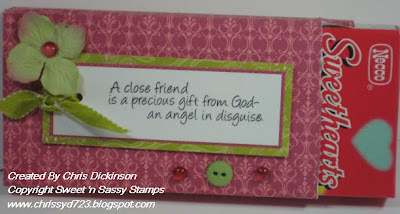 This is a card I originally made for the Sweet 'n Sassy Stamps Round Up, but I wasn't sure if I LOVED it. The ribbon did not turn out exactly like I had envisioned in my head. We would love for you to use SNS stamps for this challenge if you have them but if you don't please don't let that stop you from playing along. We just want to see your fabulous creations! When you upload to SCS/PCP please use the keyword SNSMC14 so we can see all the challenge cards in one place! Now today is MONDAY MAIL CALL too! My goal is to send out 3 cards!!! After a week down with the flu, I am back, but still not 100%. Much better than I was, PRAISE GOD! This month I am showcasing BIRTHDAY BALLOONS! 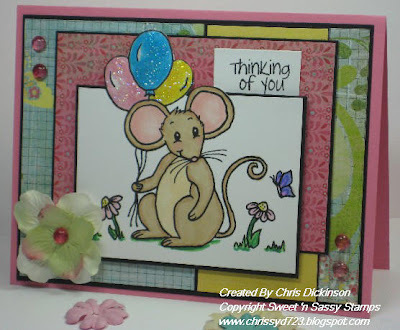 Birthday Balloons is the NEW Digi-Stamps Sweet 'n Sassy Stamps is offering. You pay one low fee, save the FABULOUS image to your computer and you can print at whatever size you choose! How cool is that!? I have a few designs that will be coming out soon and I am very excited about this. We will not be replacing the stamping with the new digital stamping , this is a way to keep costs down - have fun with a new image and get IMMEDIATE gratification! As soon as you download the image, you have it available to you! No waiting for shipping! 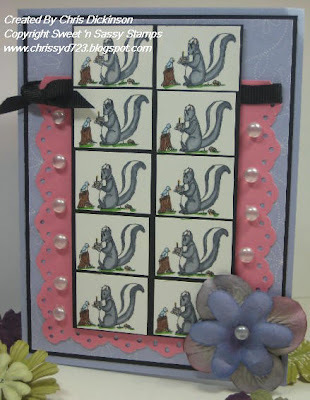 Head on over Sweet 'n Sassy Stamps Blog to see the other Design Team's projects! 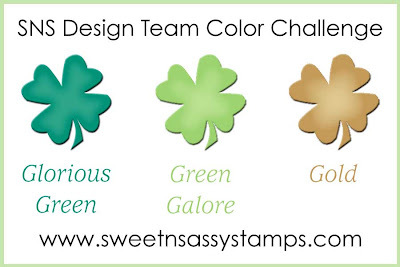 Come back tomorrow for the Sweet 'n Sassy Stamps Design Team Challenge. Have a great day! Hello! I ended up in bed most of Wednesday, very sick, so I am sorry that I do not have some thing for you to view. I do have to say, I appreciate all of your posts and comments. They make me smile. This one person made a comment this last week that especially made me smile! I love her honesty...BUT I do not know WHO you are and since you literally made me laugh out loud with your comment about the BLOG CANDY, I want to send you (Linda) something!!! Please contact me with your mailing information as I have a special gift for you! I hope I will have some time to stamp today AND feel up to it. I hope you have a great day! 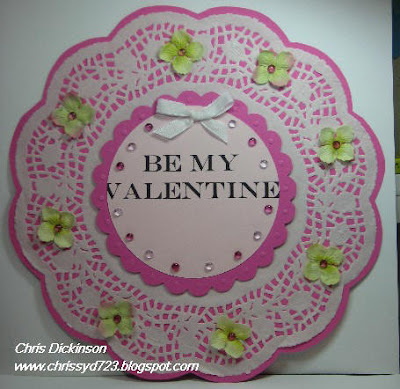 This weeks, Belli Challenge is to make a project with your DOILIES! 3. Share the link here in the comments linking to my Blog and CBC54. 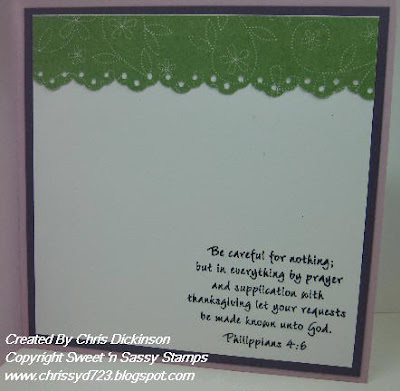 When you post to Splitcoaststampers or Paper Craft Planet or to your Blog, be sure and put CBC54 as the KEYWORD and mention of the challenge - with a link! 4. I will do a drawing and the person whose name I draw will be a BELLI GUEST DESIGNER the Third week of March. Last week's winner was Mybratz check her FABULOUS project out HERE. Her button card is unique AND BEAUTIFUL! Check it out and congratulate her!!! Now, this is my sweetheart. She loves to be with me at all times and wanted to get in on the BELLI CHALLENEGE this week - the small heart has John 3:16 inside of it. I can take a close up of it in the morning. Introducing the following THREE FABULOUS DESIGNERS, Please welcome them! MY SWEET VALENTINE with TUTORIAL, MONDAY SNS Design Team Challenge and MONDAY Mail Call! Hello! I hope you are having a WONDERFUL day! I am trying to get reacclimated into my home after being away and you know how EVERYTHING seems to PILE up. Well, I am working on my attitude. I REFUSE to allow the enemy STEAL MY JOY! I keep saying - don't sweat the small stuff, no matter how much it annoys me. :) KEEP ON SMILING. What good does it get to get mad and hold on to the bitterness, anger, etc. The only one it TRULY hurts is yourself - so for today, I choose to SMILE. Psalm 118:24 This is the day which the LORD has made; I will rejoice (regardless of my circumstances) and be glad in it! Now on to my project! 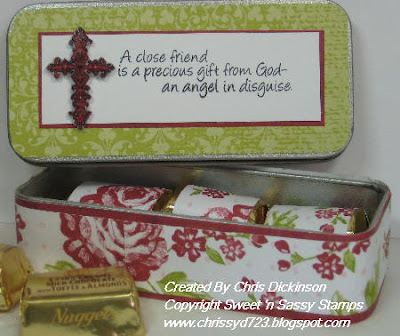 This week's Sweet 'n Sassy Stamps Challenge is to create a Valentine Treat Container...I am including a small tutorial. I hope it makes sense! 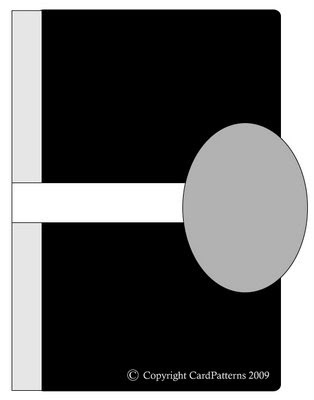 Cardstock is cut at 6 3/4" x 5 3/4"
With your cardstock facing long side in front of you Score at 3/4" , 3 1/4", 3 3/4", 4 1/4"
Turning the opposite direction Score at 3/4", 1 1/4", 5 1/4"
Trim up to the 3/4 inch lines, creating flaps. On the top portion trim off HALF of the double flap, leaving the other for the closure. Using adhesive, tape the side flap and on one side of the bottom flap. Do not forget today is MONDAY MAIL CALL DAY! I am going to mail my BLOG CANDY out - I am late in doing that and 2 other cards. How about you!? I am praying you choose JOY today too! Do not allow others to STEAL your joy! Hello Everyone! I have a friend who had a family emergency and needed to fly to Georgia to be with her family. She has six children and didn't want to seperate them all into different homes, so I volunteered to come stay at their house this weekend! Her children are 13 yo, 7 yo, 5 yo, 4 yo, 18 months and 6 months old, so I have my hands full this weekend! I will have the Sweet 'n Sassy DT Challenge for you some time late morning! IT'S FRIDAY! You know, in my world, that does not mean a whole lot... Each day runs into the next when you Home School your children. I honestly wouldn't have it any other way though! I love spending (most of the time) my days with my children. Thank you for stopping by! Be sure to check out the other Blogger Challenge participants cards! I always enjoy looking at them and I know you will too!